News in (and of) a Nutshell – A New Baby? Well, not exactly. Depending on how you look at it, she's either fifteen years old, or has been gestating for that long. 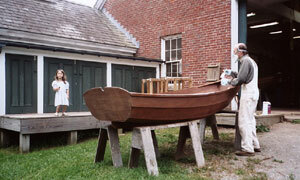 You see, I went to Wooden Boat School about fifteen years ago and came back with a nutshell pram, about 80% completed. It's been hanging in my Somesville garage untouched all these years. Like a fine wine, the wood has been aging to perfection. So, the best present I could imagine for my half-century milestone, was to earn myself a dose of self-esteem and finish the sucker. 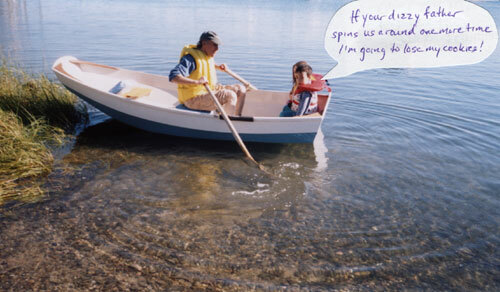 And while the kids are still small, we can all fit in it, and they can learn some seamanship. Not from me. The Mann contingent of the Gill/Mann clan will be responsible for that. I've been on sailboats a number of times but I don't have a clue what to do unless someone tells me. Nor do I provide much ballast. 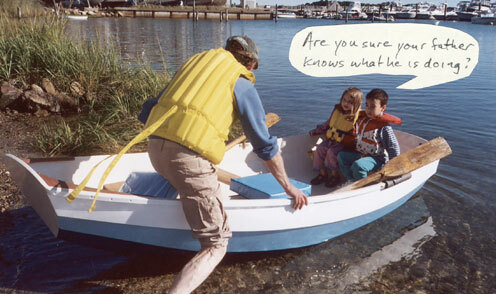 But I'm gonna learn how to sail this baby, and so are my kids. And at double its weight, I'll provide plenty of ballast. First things first though. There were still lots of things to finish before this nutshell hit the high seas. I've already admitted to not being a sailor. I'm not much of a woodworker either, unless you count my finicky perfectionism an asset. The boat was very well made because someone told me what to do every step of the way. Perhaps I ignored the unfinished project because I knew I still needed someone to hold my hand the rest of the way. Anyway, it was decided that during the end of our summer’s three weeks in Maine, I'd pick up where I left off and get this pram in the water. Before arriving in Somesville in late August, I lined up my neighbor's garage to work in, and another neighbor agreed to be on call for advice. To launch it in time for my 50th birthday seemed feasible. 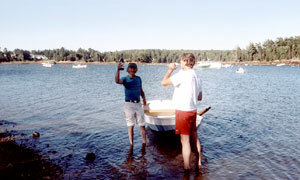 However, I'd long since lost the boat plans and there were still so many questions about what to do, that I called Wooden Boat School on August 26 for some advice. I spoke with Rich Hilsinger, the school director, who also happened to be the teacher I had long ago. When he heard about my goal to finally finish this project begun during his first year there, he told me - "You're not going to believe this, but for the first time, we're offering a week-long session called 'Finishing Your Own Boat.' It just so happens that it starts on Monday, and we've got room for another slacker." Well, he didn't use the word slacker, but he did say that there were a LOT of folks like me with unfinished hulls in their garage, which is why they were experimenting with offering this session. 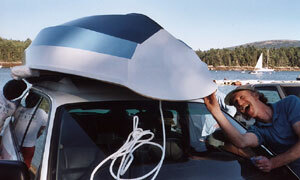 Well, I already had the boat in the neighbor's garage, had borrowed tools, bought materials and was set to go, more or less on my own. I thought about the incredibly synchronicity here for most of a second, and blurted out, "Sign me up! Please!" So, the Gill/Mann clan packed off for Brooklin and camped out at the Wooden Boat School for a week. 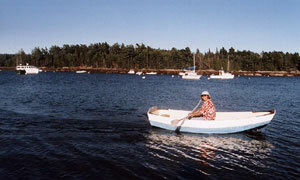 Together, we all savored the school’s great dining and while I kept my nose close to the sandpaper, Susan and the kids enjoyed the school’s waterfront and fleet. It soon became apparent that given the amount of sanding and drying time between the many coats needed to finish the boat properly, it was going to be a tall order getting the boat finished by the end of the week, let alone by birthday time. My birthday was spent sanding and painting late into the night, as was every day that week. Jillian did lend a bit of elbow grease in the process, along with Leigh Brooks, the instructor’s daughter. 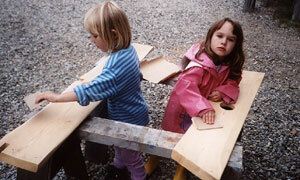 Fortunately there are no child labor laws at Wooden Boat School. You can see, however, that Jillian wasn’t a happy camper in the sweat shop, or dust shop, as the case was. She much preferred directing, safely upwind, while dad tried to not allow any toxic fumes to further derange more brain cells. To make a long process short, I’ll just cut to the launch here. On September 12, a few days unshy of my 50th , family and friends celebrated at Somesville Landing. With birthday pie, sparkling cider, and borrowed oars, the pram Sounded off into the largest natural fjord in North America. Here she is afloat with friend, Stephanie Wagner, at the oarlocks. After those who wanted to, tooled around the harbor a bit, the boat was loaded back onto the Outback for its eventual new home in our Onset garage where I swear it will not hang dry for years on end. Take a close look at the cushioning under the gunnel. Having forgotten to load the foam pieces before the launch, we improvised with what was on hand, and not yet on Avery’s bottom -- diapers! Pramster - a fun name for a pram with shades of hamster and prankster. And finally an idea is to call it all three but as an acronym - Z.A.P. Feel free to cast a vote, or submit a write-in candidate, using the highly insecure email link below. But, you know how our national election using Diebold’s partisan-rigged, unverified balloting machinery makes one highly suspect of your vote counting for anything? Well, we here at Chameleon Enterprises are up front about our Liebold system and admit that your vote is for amusement purposes only. Rest assured, though, that all emails will be read and highly appreciated. To submit a vote for the name, or just to say, "Way to row! ", e-mail Jackson at the address below.